Product prices and availability are accurate as of 2019-04-24 19:35:11 EDT and are subject to change. Any price and availability information displayed on http://www.amazon.com/ at the time of purchase will apply to the purchase of this product. This compact, stylish unit is an ideal choice for personal use and light volume applications. Slim, space-saving design leaves you plenty of room. 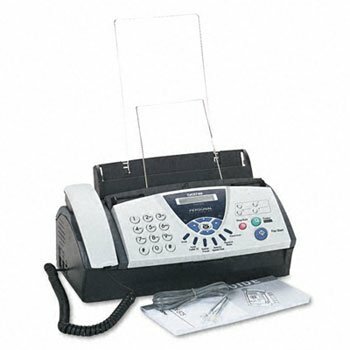 Reduces the expense of separate phone lines for fax and voice calls with an integrated telephone. Voice system offers Caller ID and Distinctive Ring Detection capabilities. Print cartridges are fully assembled and easy to replace. Offers personal copying convenience as well as a host of other timesaving features to keep your productivity high. Machine Functions: Copy; Fax; Printer Type: Ribbon Transfer; Network Ready: No; Print Resolution (Black) (Width x Height): 400 x 400 dpi. 9600 Bps fax. Sends fax in 15 seconds. Integrated voice and fax. 512 KB memory. 25-page fax memory.